Week 32: Princess Leia...well actually a Princess Leia hamburger! 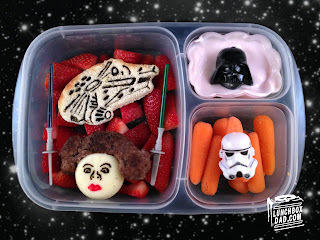 I know, I know, I just made a Star Wars lunch. The problem is my kids and I just watched The Empire Strikes Back yesterday. It was their first time and my daughter has been begging for a Princess Leia lunch. So I thought, "Why not?" I also thought I would show off some of the tools you can get to make lunch packing easier. The lightsabers/cupcake toppers, the Darth Vader decoration, and the Stormtrooper decoration are all from BentoUSA.com. You can get them for really cheap. The Millenium Falcon was made with a cookie cutter from Williams and Sonoma. You can get the whole set online. I got mine from Ebay. The point is, you can make a pretty cool lunch by using some decorations that you can find anywhere. Your kids will love it! This was made in an Easy Lunch Boxes container. You can get those on Amazon. Shape raw hamburger meat into a Princess Leia shaped wig with hair on the top and bun shapes on the side. Cook and season meat however you prefer. Draw facial features on round piece of cheese using a toothpick and black food coloring. Draw lips on face using red food coloring. Use Millenium Falcon cookie cutter to shape piece of bread and stamp it with details of ship. You may toast bread if desired and draw on details using black food coloring and a toothpick. Place cut strawberries in lunch container. Place cheese on top of strawberries and place hamburger wig above the cheese as shown in picture. Set Millenium Falcon bread above Princess Leia head. Use healthy, non-fat yogurt and baby carrot sticks (or whatever veggies your kids will eat) for the sides. Arrange Star Wars decorations however you think looks best in the container. As you can see, making a fun lunch doesn't have to be intimidating or complicated. Just use the tools you have available to you! Remember to follow me on Facebook and Twitter. Also watch our new videos that are coming out regularly on the Lunchbox Dad YouTube channel. Remember to share this with your friends! Nice! I don't think I've ever seen Leia with a meat wig before :D I like it! Thanks Jenn! Nothing like a meat wig to fight against the power of the dark side!